Last night saw the launch of Carloviana 2015 (No. 63), the journal of the Carlow Historical and Archaeological Society in the Seven Oaks Hotel Carlow by Raghnall Ó Floinn, Director of the National Museum of Ireland. The editor, Martin Nevin and his team have once again brought together a bumper issue with over 208 pages of history, archaeology, folklore, genealogy and photographs of County Carlow and its wider influences. There’s something in it for everyone but there are a number of articles which might be of particular interest for those who follow this Facebook page & blog. There is a growing interest in the value of the Blackstairs Mountains in the last number of years and the growing number of articles focusing specifically on the region is higher in this edition than ever before. “The Flight of the Raven” by Liam O’Neill is a piece of historical fiction based on the early prehistoric remains of the area. “The Hidden Bridges of the Mountain River and its Tributaries by Francis Coady does exactly what it says on the tin and describes the development and architectural features of the little known and underappreciated Mountain River bridges (sourced in the Blackstairs) with some lovely photographs. “Ogham Stones and County Carlow” by Dr. Colman Etchingham not only describes and discusses the Carlow examples of these features but also dispels some of the myths which often surround them! “The Ballon Hill Archaeological Project” by Deirdre Kearney and Nial O’Neill introduces the history and archaeology of the hill which appears to have been of major significance in prehistory (and underappreciated until now). “The Prehistoric Houses of County Carlow” by Nial O’Neill describes and discusses the nine known prehistoric houses from County Carlow revealed through archaeological excavations all of which were found in advance of the M9/M10 motorway construction. Of course these are just a fraction of the articles and topics featured. With Christmas less than a month away, this would make a fantastic present for anyone with even a remote interest in County Carlow’s past or history/ archaeology/ folklore in general. You can pick up a copy in a number of outlets in the county and towns. If you can’t make it back to Carlow in time, never fear, the modern age allows it to be delivered to your door from the Carlow Historical and Archaeological Society’s website. There’s also an article written by yours truly, co-authored with my namesake Grandfather but you’ll have to buy it to know the title. Move quick there’s only a limited supply!!! 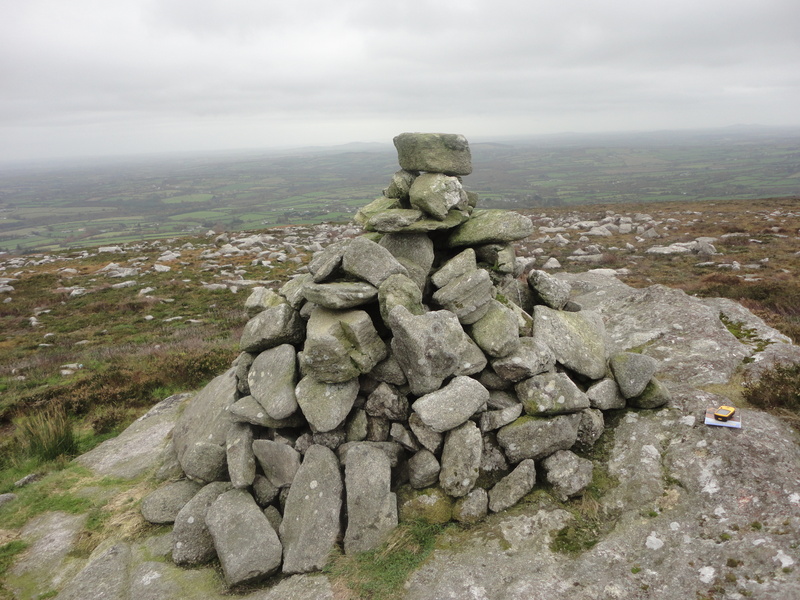 Cairns are by far the most common feature type in the Blackstairs Mountains after field wall systems. This feature type falls into many categories including summit cairns, Bronze Age burial cairns, ring cairns and field clearance cairns. Like many upland sites whose morphological features stretch across multiple periods, dates for these are often impossible to assess without excavation and even this may be fruitless. In some cases, even their function may be difficult to discern. For example a large cairn on a mountain summit may simply be a pile of stones while in other cases they are passage tombs (e.g. Seefin, Co. Wicklow WI006-003) or Bronze Age burials (e.g. Tibradden, Co, Dublin DU025-005). In some cases however local folklore can answer the question of a sites origins and function at least in the more recent past. 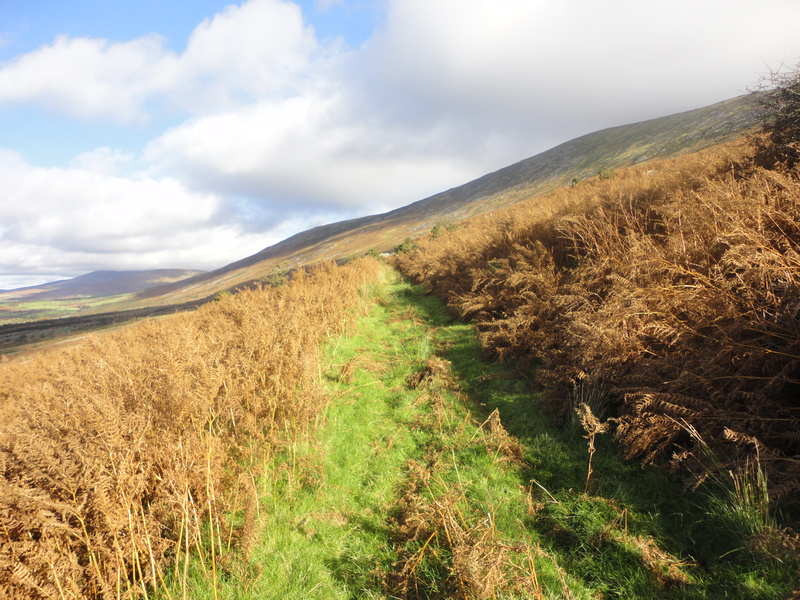 A hillwalker climbing up Blackstairs Mountain via Knockymulgurry will follow the Old Gowlin road and eventually join either the Tower or the Wexford Road. These continue upslope and over the Cooliagh Gap (“The Meeting Point”), the site of annual Lughnasa gathering until the mid-20th Century known as “Mountain Sunday” on the last Sunday in July. The roads were once an important communication artery between the Carlow and Wexford sides of the range as the long ridgeline created an imposing barrier to travel which otherwise needed to be circumnavigated. All are disused and overgrown today but have their own interesting stories to tell which will form the basis of future posts. In a relict field enclosure between the Tower and Old Gowlin Road you will see a large sub-circular central cairn of stones with two enclosing circles of stone. The central cairn is 10m in diameter and stands 1.5m high. The site is relatively flat despite its width while the radiating circles measure 25m and 31m respectively. Hawthorn trees have come to grow out of the cairn structure and it is heavily overgrown for most of the year with ferns suggesting that it may partly be an earthwork overlain with stone. It is however visible in google earth and bing imagery. The cairn is known locally as “The Height of Stones”. It is said to originate as a memorial to a local man Mr. Cantillon who was killed at that spot by a kick from a stallion. A local tradition obliged any passer-by to add a stone to the cairn in memory of the deceased (Michael Byrne pers. comm.). Given the amount of traffic this roadway would have received both as an important routeway between County Carlow and County Wexford and during the annual gatherings it is easy to see how its size would have grown to what survives today. Similarly the fields to the north are known as “The Rye Stubbles” and it is said that they produced an excellent crop. It is possible that stones brought to the surface during ploughing were cleared onto the cairn. It is also possible that this is an earlier site which was manipulated to suit a later purpose. There is large standing stone (CW025-005) to the north of the site at the old crossroads. 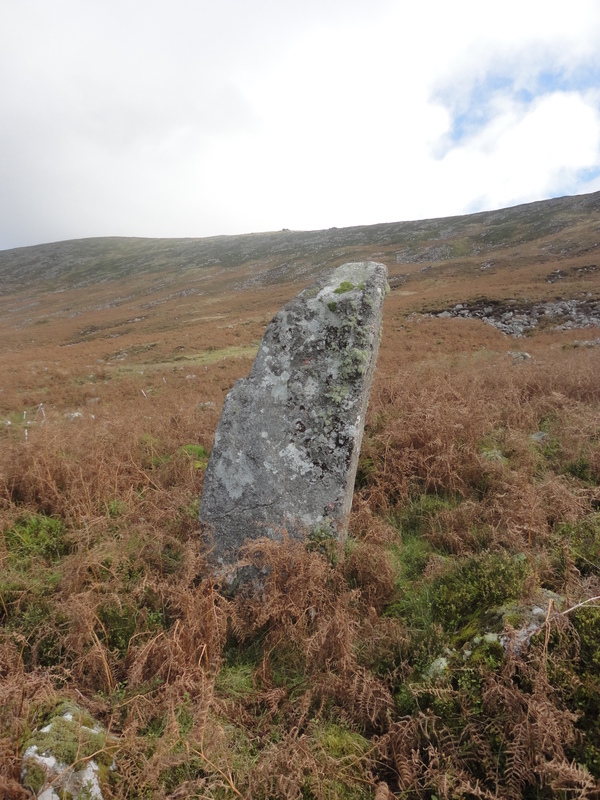 Similarly there is Iron Age activity suggested by the Lughnasa gathering, a legend of the pre-Christian deity Cathair Mor at Caher Roe’s Den which overlooks the site as well as absolute proof in the discovery of a deer trap in a peat hag on Blackstairs Mountain in 2011. Whatever its original date or purpose, spare a thought for Mr Cantillon next time you pass! Byrne, Michael, Dranagh, Co. Carlow. Pers. Comm. Evans, E. E. 1966 Prehistoric and Early Christian Ireland: A guide. London; B T Batsford Ltd.